New Spray Foam Roofing - San Diego Roofing Inc. PLEASE NOTE: Due to the extremely high cost of foam roofing, along with its extremely high failure rate, San Diego Roofing, Inc. has decided to remove this option from our line-up. We have other roofing options available that have proven to be more reliable and cost effective. Sprayed Polyurethane Foam is applied as a liquid using plural-component spray equipment to fill cracks and crevices. It then expands approximately 30 times its original liquid volume to form a hard, closed cell monolithic roof surface. 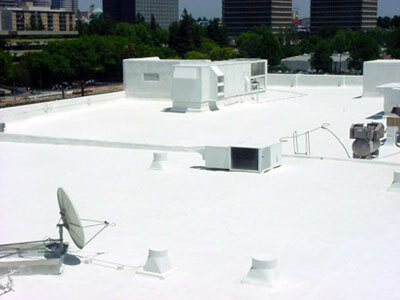 The Polyurethane Foam dries within seconds after applied to the roof surface. Its expansion results in a weather tight roofing membrane that is fully adhered to the substrate. Once the SPF has been applied to the proper thickness and finish specifications, a protective layer of coating or gravel is applied. This protective layer produces a durable weather resistant surface and that can be walked on for normal maintenance. Because of polyurethane’s lightweight it adds very little additional weight to the structure and is often used in remedial applications. Polyurethane Foam has a history of more than 35 years as a maintainable roofing medium. Polyurethane Foam adds excellent insulation value to the structure and utility bills can reflect the difference.